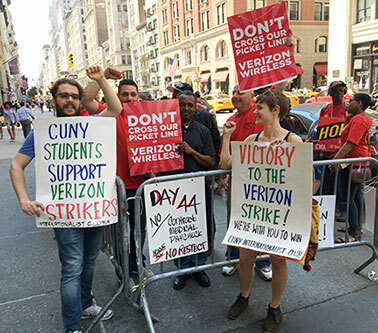 “Picket Lines Mean – Don’t Cross!” chanted Verizon strikers in New York City through six and a half weeks of their bitter fight against the telecom giant. “Picket Lines Mean – Don’t Cross!” yelled supporters of locked-out faculty as they picketed Long Island University in downtown Brooklyn earlier this month. So did locked-out Bröd bakery workers earlier this year. They picked up the chant from Internationalist activists, but the point it drives home is as basic as it gets: the picket line is the battle line of class struggle. It’s the class line: on one side are the striking or locked-out workers, on the other side are the bosses and those working for and with them. 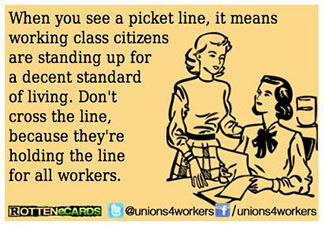 The issue is simple: it’s which side are you on, as the famous labor song put it. On Verizon strike picket line outside Verizon Wireless store, May 26. It’s the class line: Don’t cross! Working behind picket lines in a struck facility means stabbing fellow workers in the back, betraying the fundamental solidarity the working class needs if it is to win its struggles – from a strike or resistance to a lockout to the fight for power. 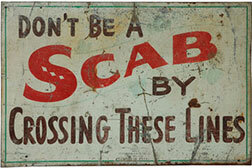 The name for this kind of treachery is as old as the picket line itself: it’s called scabbing. “Don’t scab for the bosses, Don’t listen to their lies,” say the lyrics of the Harlan County miners’ song, the answer is to “organize.” And in case you didn’t get, the song adds: “There are no neutrals there.” Young people learning the ABCs of class-struggle politics today can go on-line to find “The Picket Line Song,” which says: “‘Solidarity Forever’ don’t mean just sometimes… You should never walk across a picket line!” (https://www.youtube.com/watch?v=E8KlKTZqp0g). The shameful IBT pamphlet was devoted to teaching people that working behind picket lines in a struck building is dandy – so long as you make the usual hypocritical gestures of “solidarity.” The IBT had one proviso: picket-line crossers should please avoid doing the exact work of the employees on the strike pickets outside. This is the logic of labor aristocratic craft unionism, which says it’s fine for unions to scab on each other, crossing each others’ picket lines, so long as they abide by divisions between the various trades. 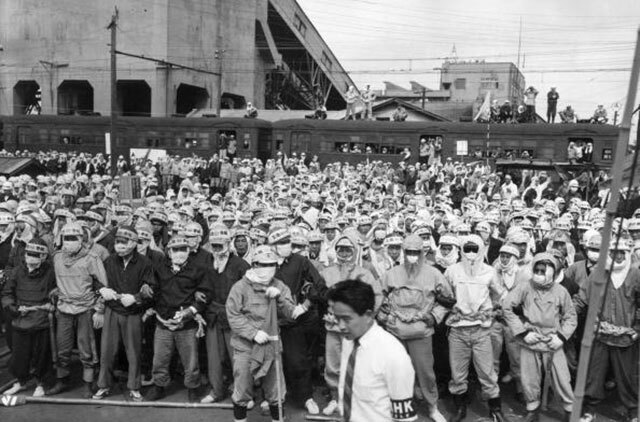 The idea that it’s okay to cross picket lines – and its embodiment, the abominable oxymoron of a so-called “informational picket line” – is both a key cause and reflection of the drastic weakening of union power over the past decades. “In 1996, janitors employed by building maintenance companies across New York City carried out a four-week strike against the introduction of a lower tier pay scale for new workers. During the strike, an IBT supporter, Jim C., and other union members at his workplace, the Village Voice, managed to prevent the building management employing scab janitors at the Voice and raised a considerable amount of money for the striking workers. Jim's role in the strike was subsequently the subject of a polemic with Workers Vanguard (WV, publication of the Spartacist League). 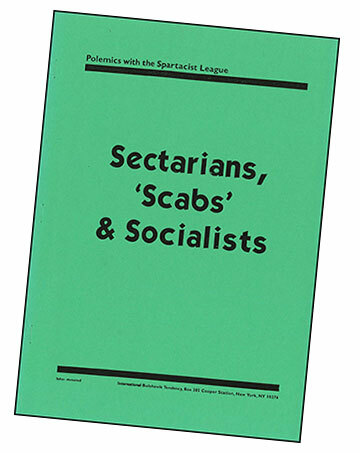 Articles from WV and letters to the paper by Jim and another IBT supporter in New York were later published by us in a pamphlet entitled ‘Sectarians, ‘Scabs’ & Socialists,’ in which we defended his actions. What’s going on here, a reader might ask? 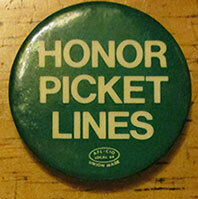 Did the IBT all of a sudden “get it” that picket lines mean don’t cross? No way. Note that while it is making this shamefaced admission, all that the IBT is repudiating is the fact that its supporter was doing the specific work normally done by the strikers. 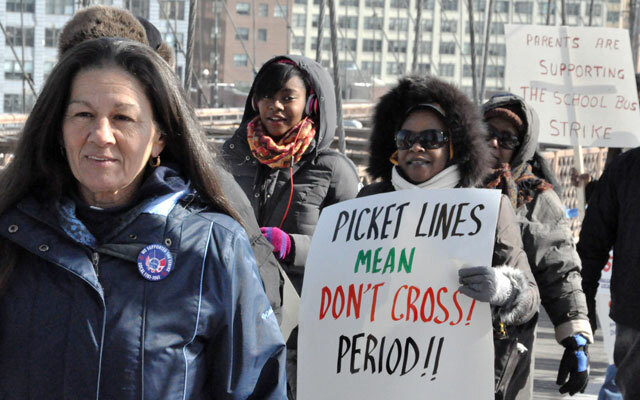 It pointedly does not repudiate crossing picket lines, and thus continues to uphold the IBT’s longstanding defense of going into a struck, picketed location and working behind picket lines – i.e., scabbing. In response to the 20-years-after-the-fact “repudiation,” the IBT’s former supporter Jim C. circulated a letter charging that “the IBT, apparently under pressure from the IG, has shamefully capitulated to one of Norden’s smears.” However, in this letter Jim C. confirms that he and others had indeed performed cleaning work normally done by the workers who were on strike at the Voice – while stating irately that the IBT has had every opportunity and reason to know this for the past two decades. 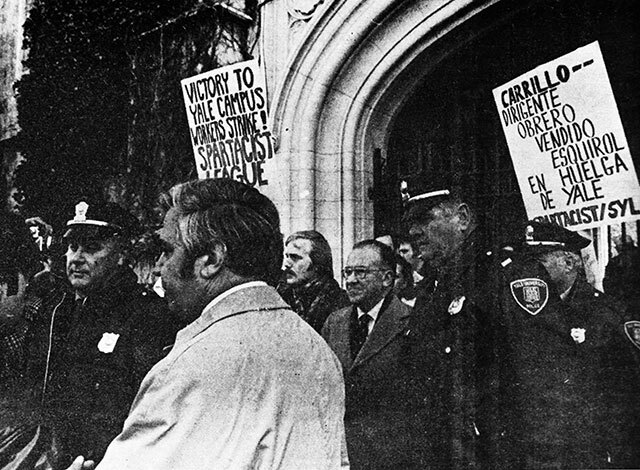 Moreover, as we learned some years after the episode from a person who worked there, as a UAW shop steward Jim C. called a meeting with the Voice staff on the eve of the strike where they were told it was okay to go into work and that they would bag their own garbage. Thus the then IBT supporter not only scabbed, working behind 32BJ picket lines day after day, he was a scab-herder and then directly lied about it in his letter to WV. So why the sudden revelation from the IBT now? The answer is that two youth who were around the IBT approached Internationalist Group comrades at the Left Forum in New York this past May, asking about some of the key differences between the IBT and the IG. After all, they said, both groups claim continuity with the historic Trotskyist program, and specifically with the programmatic tradition going back to the Revolutionary Tendency of the Socialist Workers Party in the early 1960s, which went on to found the Spartacist League in 1966. There’s a world of difference, we pointed out: the IG was formed by left oppositionists expelled for fighting to defend the revolutionary program and bring it into the class struggle, and consistently upholds the revolutionary program abandoned by the now centrist SL/ICL. The IBT, in contrast, coalesced from demoralized quitters moving rapidly to the right, expressing the pressure and outlook of the labor aristocracy and bureaucracy. Just look at the IBT’s defense and outright promotion of scabbing, we said. This came from a group whose founding publications read like a National Enquirer of rank anti-communist smears, while the first issue of the IBT’s 1917 went out of its way to rail against “the deranged rantings of MOVE’s founder, John Africa.” This in an article attacking the SL for not distancing itself sufficiently from the black back-to-nature MOVE commune at a Spartacist forum featuring two relatives of victims of the horrific Mother’s Day 1985 incineration of MOVE members in Philadelphia. In our correspondence with the two IBT contacts this summer, we systematically explained the class principle behind the picket-line question, highlighting key struggles to defend the bedrock principle that picket lines mean don’t cross. We explained how the McCarthyite red purge against leftists in U.S. trade unions paved the way for the anti-communist, pro-Democrat union bureaucracy to dilute and undermine basic labor principles, how the union bureaucrats caved in to anti-labor laws like Taft-Hartley, how employers have increasingly used subcontracting to divide and conquer the workforce, how the notorious “two-gate” system is used by construction companies and other firms during many strikes. We noted that “Our comrades in Portland were won from a group of construction workers they had formed called Cross-Trades Solidarity, dedicated to promoting and enforcing the picket-line principle against sell-out union bureaucrats who tell workers it is OK to cross each others’ picket lines.” In another e-mail, we pointed out that the non-union drivers at Fed Ex had more class consciousness than the IBT, since during the ’96 32BJ strike they dropped packages on the curb rather than cross the picket lines. We noted that the struggle of British dock workers in Liverpool came about because hundreds of workers refused to cross a picket line of another group of workers, and were fired as a result. 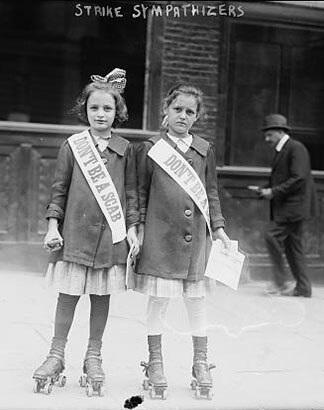 We referred the then IBT contacts to Billy Bragg’s song, “Never Cross a Picket Line” (https://www.youtube.com/watch?v=ojPTz4VAOMA) about the Liverpool dockers’ struggle. So two and a half months later, the IBT suddenly “discovered” that its factual claims of the past 20 years were false, and that its former member did what even by its narrow definition constitutes scabbing (although they pointedly avoid the word). Given its “repudiation” of its ex-supporter’s actions, but not of its shameful political line that crossing picket lines is all right if the sellout bureaucrats approve and so long as you don’t do the strikers’ work yourself, the IBT may have to do a little editing if it is to issue a post-“repudiation” edition of its pamphlet, Sectarians, ‘Scabs’ & Socialists.